Oxford University Press, USA, 9780190681340, 288pp. 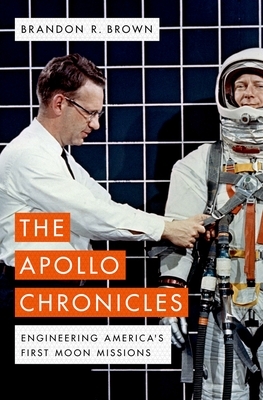 In The Apollo Chronicles, fifty years after the moon landing, author Brandon R. Brown, himself the son of an Apollo engineer, revisits the men and women who toiled behind the lights. He relays the defining twentieth-century project from its roots, bringing the engineers' work and personalities to bright life on the page. Set against the backdrop of a turbulent American decade, the narrative whisks audiences through tense deadlines and technical miracles, from President John F. Kennedy's 1961 challenge to NASA's 1969 lunar triumph, as engineers confronted wave after wave of previously unthinkable challenges. Brown immerses readers in key physical hurdles--from building the world's most powerful rockets to keeping humans alive in the hostile void of space--using language free of acronyms and technical jargon. The book also pulls back from the detailed tasks and asks larger questions. What did we learn about the Moon? And what can this uniquely innovative project teach us today? Brandon R. Brown is a Professor of Physics at the University of San Francisco. His research includes work on superconductivity and sensory biophysics. He enjoys writing about science for general audiences, including articles and essays in New Scientist, SEED, and the Huffington Post, as well as a biography, Planck, that won the 2016 Housatonic Award for Nonfiction.